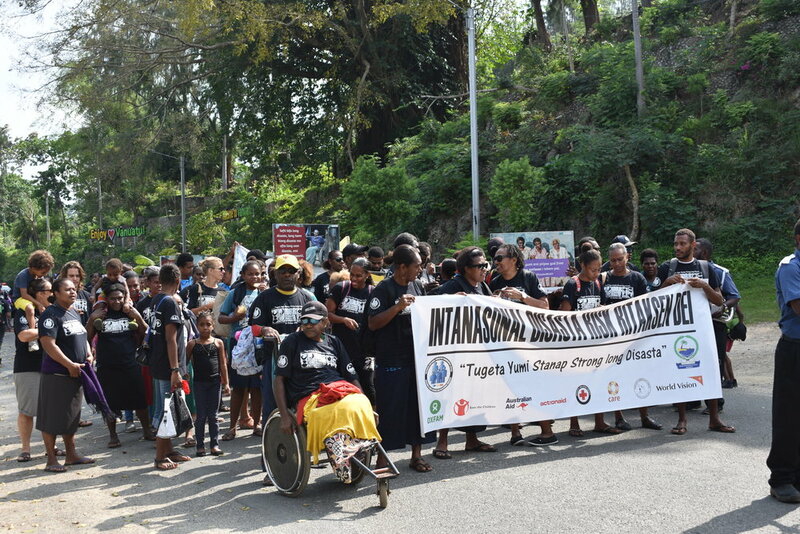 Above: Disaster READY Vanuatu organised a parade to mark International Disaster Risk Reduction Day 2018. Photo credit: Care Vanuatu. Over the last four years, Ni-Vanuatu people have faced extraordinary environmental adversity and a series of severe natural disasters. The expansive coastal archipelago was dealt Tropical Cyclone Hola, Donna and Cook and stood against drought, landslides, flash flooding, tsunami, earthquakes and volcano eruptions; one of which – just this year - has resulted in a major state of emergency and an evacuation of approximately 9,000 people from the island of Ambae. This closely followed Tropical Cyclone Pam in 2015, which saw almost 65,000 people displaced. Disaster preparedness has understandably became a national priority. For people at risk of social exclusion and discrimination such as women, children, people with disability and other diverse groups, the impact of disaster is even more acute. Traditionally overlooked in decision making processes and with limited access to resources, options and decision making power, these are people often left with little or no voice in disaster preparedness and response. Disaster READY began in Vanuatu in 2018, implemented by Action Aid, CAN DO/Act For Peace, CARE Vanuatu, Oxfam, Save the Children, World Vision and their local partners, with a strong commitment to working alongside Vanuatu Government and local organisations to strengthen disaster preparedness. “The consortia in Vanuatu is unique, as is the diversity and remoteness of Vanuatu communities. The reach of six Australian NGOs has resulted in the ability to tackle disaster preparedness in five of the six provinces,” explained Georgia Noy, AHP Vanuatu Shared Services Coordinator. “The focus of inclusion from all parties has resulted in rich discussion and application across all six partnerships. When AHP partners, national government, church groups and local civil society are all in the same boat, the impact is greater and is locally driven,” she said. In 2018, the foundation year for Disaster READY, the Vanuatu Disaster READY consortia invested in partnerships in Tafea, Shefa, Malampa, Penama and Sanma provinces - all but one province in Vanuatu. Penama Province: A shared approach by CARE Vanuatu and Save the Children as co-leads to strengthen the Gender and Protection cluster in the recent Ambae volcano emergency. Both CARE Vanuatu and Save the Children were focused on supporting the Gender and Protection Cluster to monitor and advocate for the needs of vulnerable people who were living in evacuation centres. CARE has also partnered with Save the Children on a UNWomen funded project that aims to strengthen women’s leadership. A core component of this project has been supporting national civil society organisations to engage more actively in the gender and protection cluster, in-line with the localisation agenda. Shefa, Sanma, Malampa and Penama provinces: Local implementing partners for CAN DO, Act for Peace with Vanuatu Christian Council, facilitated strong consultation with the National Disaster Management Office (NDMO), Pacific Disability Forum and local church groups to develop SAFE n REDI - a website that will provide the NDMO, AHP partners and other relevant stakeholders throughout the whole of Vanuatu with geo-spatial mapping of churches that can be utilised as evacuation centres. SAFE n REDI will also assist churches to prioritise their maintenance as an identified evacuation centre in order to better assist people living with a disability and vulnerable groups. It will support the development of evacuation centres that are safe, inclusive and built to ensure rights and dignity is respected for all people – regardless of gender, age or ability. Sanma Province: Participatory 3D Mapping (P3DM) workshops delivered by World Vision have begun to see communities include people with disabilities and Disabled Peoples Organisations (DPOs) when preparing and responding to a disaster. Collaboration with the Sanma Provincial Disaster Officer resulted in 2019 plans to ensure active participation of women in the training of Provincial Emergency Operation Centre members. World Vision included Disaster READY partners and key community stakeholders in workshops that supported cross-learning and network development. Tafea Province: CARE Vanuatu: worked together with the Tanna community of Lenakel, Vanuatu Meteorology and Geo-hazards Department (VMGD), Pacific Community, World Vision and Vanuatu Red Cross to facilitate earthquake and tsunami training with the local Community Disaster and Climate Change Committees (CDCCCs) to develop disaster and response plans to earthquakes and tsunamis. CARE Vanuatu invited DPOs and people with disabilities from Tanna communities to be involved in the training and response planning. Following the training, CARE Vanuatu delivered the first tsunami drill in Lenakel. Because of this inclusive planning, people with disability had a voice in what support they needed that ensured dignity and safety in community disaster response. This resulted in CDCCCs identifying the types of disability within the community and having a plan to assist wheelchair users and emotional support for psychosocial disability. The benefit of this drill was seen no sooner than two months later when a real tsunami alert was issued for Tafea Province. The community were quick to put what they had practiced into action moving swiftly to higher ground. Shefa Province: The partnership with Wan Smol Bag Theatre (WSB) continues to strengthen Oxfam’s work through the Disaster READY Program. WSB helped implement disaster preparedness with selected communities on Epi, developing CDCCC and disaster response plans. Oxfam is also supporting Area Secretaries to lead on strengthening CDCCCs. This approach prioritises and results in a localised approach to disaster preparedness training. Evidence of the power of collective, joint messaging is beginning to emerge as the Vanuatu Disaster READY consortia strengthens its partnerships across the nation. In working together, planning and sharing of ideas through the various working groups, the Disaster READY Vanuatu consortia have been able to ensure that a stronger and consistent focus to communities, civil societies, sub national, national government and other relevant stakeholders under the Disaster READY project. The successful delivery of the tsunami training (and subsequent application in response to a tsunami alert), the P3DM training, development of SAFE n REDI and the reach and power of joint advocacy on International Disaster Risk Reduction Day showcased what can be achieved.